Have fun with your hamper with this cheeky new Crush Hamper. The Crush Hamper has the unique and wonderful ability to be crushed down when not in use. Simply press down on the aluminum rim at the top of the hamper and watch as your hamper crumples under your strength. Such a hamper saves spaces by taking up less room when not in use. When you have need of it, simply grab it by that same aluminum rim at give it a downward jerk-like putting a pillow in a pillowcase. Your hamper instantly reshapes itself into, well, a hamper. Set your hamper up in the laundry room. Put it in a bedroom. Pop another in the bathroom. All week long, let it collect your laundry. Then, on laundry day, empty your hamper and Crush it down. Pop it open and Crush it again just because you can. The Crush Hamper is attractively designed. It comes in sleek black with a silver rim, so you always know where to grab. 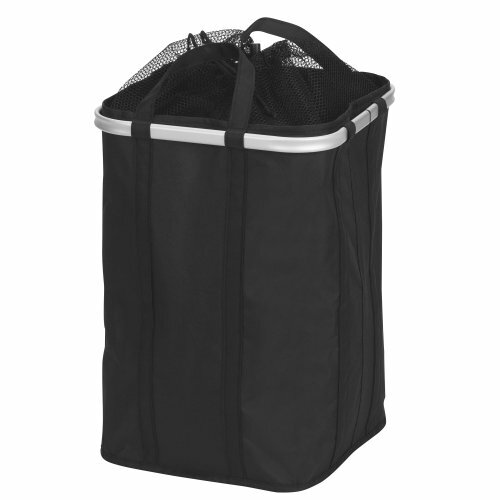 The Hamper also features a convenient mesh closure that extends beyond the top of the hamper, so even overfilled hampers can contain their loads. The mesh cover allows laundry to breathe even while keeping it contained. A drawstring close keeps it that way during transport. Measures 19"h x 13"w x 13"l. Item #2225. View More In Laundry Storage & Organization.